An association coming under the French Law of July 1, 1901 and Decree of August 16, 1901 (relating to not-for-profit organizations) is created between the adherents to the present Statutes. 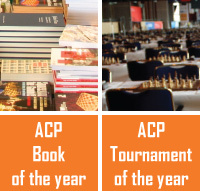 The name of the Association is Association of Chess Professionals (ACP). The Association's purpose is the protection of professional chess players' rights, the practice and promotion of chess worldwide, in particular through the organization of chess tournaments and other chess events. The Association's head office is located Le siège de l'association fixé 9 rue de l'asile Popincourt, 75011 Paris, France. It can be transferred by simple Board decision. Approval by the General Assembly will be necessary. A chess player having the FIDE title of International Master (IM, WIM) or International Grandmaster (GM, WGM) can become a member of the Association upon the payment of the membership fee. However, if a candidate for membership has in the past committed acts contradicting the principles stated in Article 6 of the present Statutes, the Board has the right to refuse his membership, provided this decision is supported by 2/3 out of Board members. People having none of the above mentioned titles may apply for admission. These people are chess trainers, chess arbiters, chess organizers, chess teachers, chess journalists, presidents of chess club. This list is not exhaustive. They have to prove that chess constitutes an important part of their professional activity. Their admission is submitted to the approval of the Board. In case of refusal, a notification should be sent to that person by e-mail, and his membership fee reimbursed. Members commit themselves to respect the other members' freedom of thought and abstain from any social, religious or political discrimination, as well as any acts which may harm the Association's interests. Members must pay an annual membership fee by the date set up by the Board. The amount is to be fixed every year by the Board. - expulsion due to the violation of the Article 6 or the Internal Rules (Article 17), after hearing the involved member's explanations, provided this decision is supported by 2/3 of Board members, a notification should be sent to that person by a registered letter or e-mail. - all resources authorized by the law. The Treasurer holds a comprehensive accountancy of all revenues and expenses. The annual budget is adopted by the Board before the beginning of the fiscal year. The fiscal year coincides with the calendar year. It cannot exceed twelve months except for the first fiscal year. The accounts must be approved by the General Assembly within twelve months after the fiscal year closing. Any contract or agreement passed between the Association, on the one hand, and an external administrator or consultant, on the other hand, is submitted to the Board for authorization and presented for information at the next General Assembly. The Association is run by a board of 11 members elected for 4 years by the General Assembly (Article 15). The Board's function is, among others, to initiate debates concerning official tournament rules, proposals to improve professional players' conditions, to search for sponsors in order to organize tournaments under the aegis of the Association, to establish the agenda of the General Assembly, etc. This list is not exhaustive. There should be at least one male and one female representative in the ACP Board. All members over 18 years are eligible and re-eligible. The Board elects among its members a President, a Board Director, a Treasurer, and a General Secretary. The President represents the Association in all civil acts. In particular, he has authority to go to court on behalf of the Association. The Board Director leads the work of the Board. The General Secretary is in charge of anything related to correspondence and archives. He takes the minutes of meetings and assemblies and, in general, any writings related to the Association's operation, except for those concerning accountancy. He holds the special register provided for by article 5 of the law of July 1, 1901 and articles 6 and 31 of the Decree of August 16, 1901. He ensures that the formalities prescribed by these articles are executed. The Treasurer is in charge of holding or having held under his control the accountancy of the Association. He makes all payments and receives all sums due to the Association, under the supervision of the President and the Board Director. He cannot dispose of the assets constituting the reserve fund without the authorization of the Board. He holds a regular accountancy of all the operations he performs and reports to the annual General Assembly, which approves his management. In case of vacancies, the Board provides with a replacement of its members, until the next elections. The Board gets together at least once every six months, when summoned by its Board Director or at the request of at least 5 of its members. Board meetings can be held on the Internet. Decisions are taken by a simple majority of all Board members' votes, except in the cases described in Articles 5 and 8. The Board Director has a casting vote. Meetings are subject of minutes. The members of the Board are entitled to the reimbursement of their expenses on written proof; travel expenses will be reimbursed on the fiscal administration scale. Their functions are voluntary. All ACP members have the right to take part in the General Assembly (GA). - or the internet site of the Association. The notification will include the agenda's project, which will be set up by the Board. Members have two weeks to ask the Board to include their questions in the agenda. The final agenda should be published one week before the GA is held. GA is held every year within twelve months after the closing of the fiscal year. GA can take place on the Internet and all votes can be held on the ACP official site, including the Board election. All members registered in the Association at least 12 months before the date of the beginning of the GA have the right to take part in votes. GA elects every forth year the members of the Board. Decisions are taken by secret ballotby a simple majority of the voting members, except the elections to the Board which are taken by the relative majority. GA is entitled to make amendments and additions to the Statutes. The President, assisted by the Members of the Board, presides over the GA and expounds the situation of the Association. The Treasurer reports his management and submits the balance sheet to the GA's approval. Minutes of the GA will be taken. They are to be signed by the President or the Board Director and the General Secretary. Extraordinary General Assembly (EGA) is competent to modify the Statutes, decide on dissolution and merger of the Association. It is summoned by the President, or at the request of at least 1/3 of the members, or at the Board's request. It should include the agenda's project. Members have two weeks to ask the Board to include their questions in the agenda. The final agenda should be published one week before the EGA is held. EGA can take place on the Internet and all votes can be held on the ACP official site. All members registered in the Association at least 12 months before the date of the beginning of the EGA have the right to take part in votes. Decisions are taken by secret ballotby a simple majority of the voting members. Minutes of the EGA will be taken. They are to be signed by the President or the Board Director and the General Secretary. The Board can decide to establish Internal Rules. They are mandatory for all the members of the Association. Violation of the Internal Rules may lead to the exclusion of the Board or of the Association, provided this decision is supported by 2/3 out of Board members. Dissolution is pronounced by the Extraordinary General Assembly, which appoints a liquidator. Assets will be devoted as per article 9 of the French Law of July 1, 1901, to an association pursuing the same objective. Only the French version is authentic.